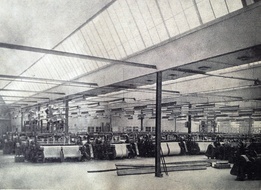 Blanc des Vosges, one of the last remaining family-run textile companies manufacturing bed linens in the Vosges, celebrates its 170th anniversary in 2013…an opportunity to retrace the history of this exceptional company and take a closer look at its special know-how steeped in the 100% Made in France! The company François Hans is born. 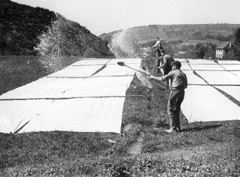 Cloth is woven for the first time on hand looms in farmhouses in the areas surrounding Gérardmer. The company innovates with the installation of the first mechanized looms for linen cloth in the Vosges region and are the first company to start bleaching cloth in the fields. Mr François Hans and Mr François Lambert, relaunch the company François Hans. 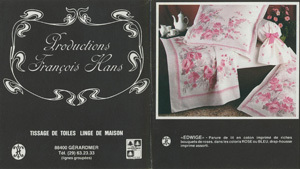 Creation of the label of origin “Trois Sapins”, label which is replaced progressively by labels lauding the authenticity of the company’s products. Following the comprehensive destruction of weaving facilities during World War II, François Hans rebuilds those facilities. 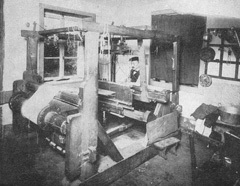 The first printed ranges are brought to market. It is the beginning of a story that has yet to end. 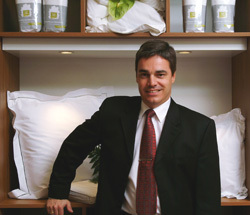 Jean François Birac, 4th generation and grand-son of François Lambert takes over at the head of the comapny. 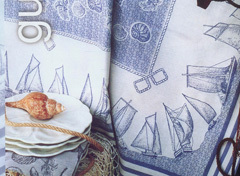 Launch of the first range of jacquard woven table linen. 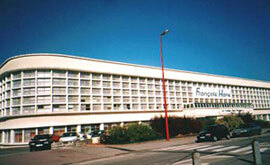 François Hans moves into 12 000 m² of new factory facilities tailor-made for a growing company in the heart of Gérardmer. François Hans manufactures more than 900 000 items annually distributing them via 1500 resellers throughout France and other Export markets. 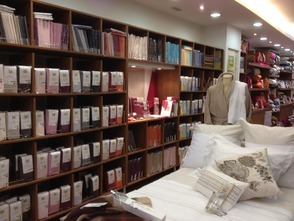 François Hans opens its first boutique in Paris, 7th arrondissement under the Blanc des Vosges banner. Jean-François Brac decides to reposition the company by launching the more modern Blanc des Vosges concept which continues to develop on an ongoing basis. 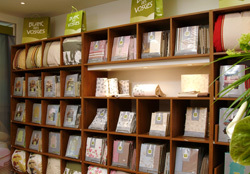 Blanc des Vosges is rewarded for its regional production, know-how and french heritage with the Vosges terre textile label. A few months later, the company is also awarded the Entreprise du Patrimoine Vivant label in recognition of these exceptional qualities. Blanc des Vosges celebrates 170 years of Excellence in the manufacture of bedlinen products, with the launch of the the Prestige range sponsored by Princesse Tania de Bourbon Parme. Highlighting historical and geographical roots and, through the creative arc, creativity, a new Blanc des Vosges logo reaffirms brand position and identity.